DELTA Testing Services Associate Brad Collins (left) pictured with a student who is turning in a test at the Centennial Campus Test Center. Senior Vice Provost Tom Miller answers questions about the long wait times during fall 2018 finals. Back in December, snow came at an inopportune time for NC State students and faculty, disrupting the start to fall semester final exams. After the university reopened, DELTA test centers struggled to keep up with demand from test-takers. On Tuesday, there were reports of long waits for students to take an exam at DELTA test centers, as there was a delayed opening of the university. By Wednesday, students were waiting in line outside the Venture IV building long before the Centennial Campus Test Center opened. First, I want to offer my sincere apologies for the inconvenience and frustration that was experienced by students who had long waits as a result of the weather delay. We don’t know how long students waited in line to check in for their exams as DELTA’s software records the time between check-in and when an exam is started. But we do know that the average wait-time between check-in and starting an exam at the Centennial Campus Test Center was 91 minutes on Tuesday [December 11, 2018], and 169 minutes on Wednesday [December 12, 2018]. A peak average wait-time of 279 minutes [4 hours 39 minutes] was recorded for students who checked in at the Centennial Campus Test Center between 12 p.m. and 1 p.m. on Wednesday [December 12, 2018]. The loss of a day and a half of the final exam period caused severe compression, because everyone who had planned to take exams on Monday [December 10, 2018] or Tuesday [December 11, 2018] morning had to come to DELTA test centers later on, resulting in much more demand than normal for the rest of that week. There were simply too many students wanting to take their exams immediately after the university reopened for our test centers to handle. 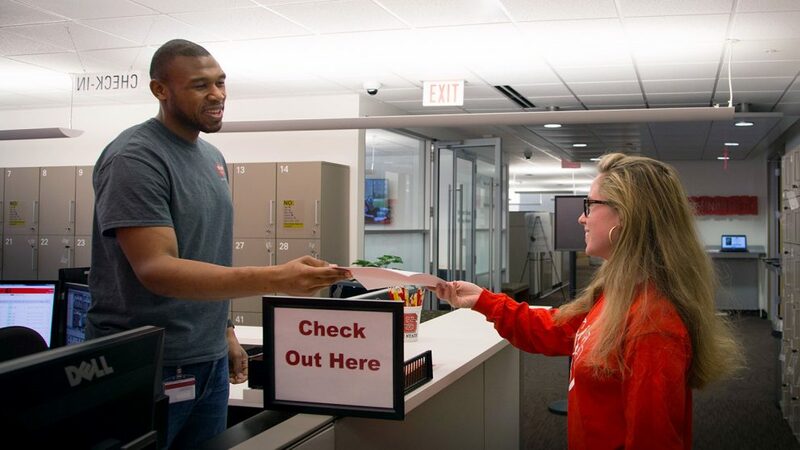 DELTA test centers were operating under a walk-in, first-come-first-served model that had worked well for several years, but could not cope with the high volume experienced during finals due to the university being closed for inclement weather. Once the compression resolved, wait times became much closer to what we’d normally expect. Average wait times at the Centennial Campus Test Center were down to 8 minutes or less by 6 p.m. on Thursday [December 13, 2018], and by 3 p.m. on Friday [December 14, 2018]. Daily average wait times of 2-4 minutes were recorded for each of the last two days of finals [Monday, December 17, 2018 and Tuesday, December 18, 2018]. DELTA administrators had proactively arranged for additional testing space in the D.H. Hill Library where paper exams could be administered. As the weather situation developed, they also planned and announced the opening of the Centennial Campus Test Center on the weekend for computer-based exams; at first on Saturday [December 15, 2018] only, and then both days [Saturday, December 15, 2018 and Sunday, December 16, 2018] as the weather delay progressed. Why didn’t DELTA use campus computer labs to help provide more testing capacity? For online exams, computers are only one part of the solution. DELTA also has to provide the proctoring piece, which requires privacy screening between the workstations, specialized software on the computers, and video surveillance in the rooms. NC State’s accreditation [by SACSCOC, the Southern Association of Colleges and Schools Commission on Colleges] and DELTA Testing Services’ NCTA [National College Testing Association] certification both depend on us maintaining compliance with strict standards for the integrity of online exams. What accommodations were made for students standing in line in the cold? Getting students inside and out of the cold was our top priority. With the cooperation of the property management company, we were able to use an adjacent, vacant office suite as a waiting area. Once students had been moved inside we determined that waiting to check in at the kiosk computers was causing a bottleneck. I immediately authorized deployment of an experimental mobile check-in web app that we had under development. After using the mobile check-in app to hold their place in a virtual line for a seat at the Test Center, students were then able to go elsewhere to wait. Another DELTA web app, WaitTime, allowed them to monitor the number of students ahead of them waiting to be served and determine when to return to the Test Center. While there was still a significant gap between check in and being seated for the exam until the compression effect settled, the combination of the mobile check in and WaitTime fully resolved the issue of students having to physically wait in line. Did you implement any preventive measures to keep this from happening again? During finals we were able to try out some new software for making appointments to take exams during the extended weekend hours. Each student had a guaranteed time to take their exam, with minimal or no waiting, and the daily average wait-times recorded were 1-2 minutes. Beginning in the spring 2019 semester, we permanently implemented appointment-only testing. However, testing by appointment is not a panacea. Because, by its nature, a reservation system does not make the most efficient use of test center seats, testing by appointment will inevitably require extended opening hours during peak times, such as final exams. We will also work with instructors to spread out the testing windows for finals to avoid peak effects. Our two permanent test centers have only 150 seats between them; 112 seats at the Centennial Campus Test Center and 38 seats at the Cox Hall Test Center. Having more seats available would help to keep test center opening hours shorter. We have been working with the University Space Committee for about a year to identify and fund expansion space for the testing center. We expect the demand for online and hybrid courses with electronically administered exams to continue to increase, proactive capacity planning is a critical part of our ongoing strategy. Weather events and other unpredictable disruptions will always be a challenge, but we believe that the lessons learned and the policies, contingency plans, and technologies that we put in place to get us through the December exam period will help mitigate the problems we may face in the future under similar circumstances. We created an FAQ page to answer students’ questions about appointments.